As well as individual work, the team delivers projects to create a forum for people to share and celebrate people’s rich life stories. With this aim they have recently produced a recipe book. 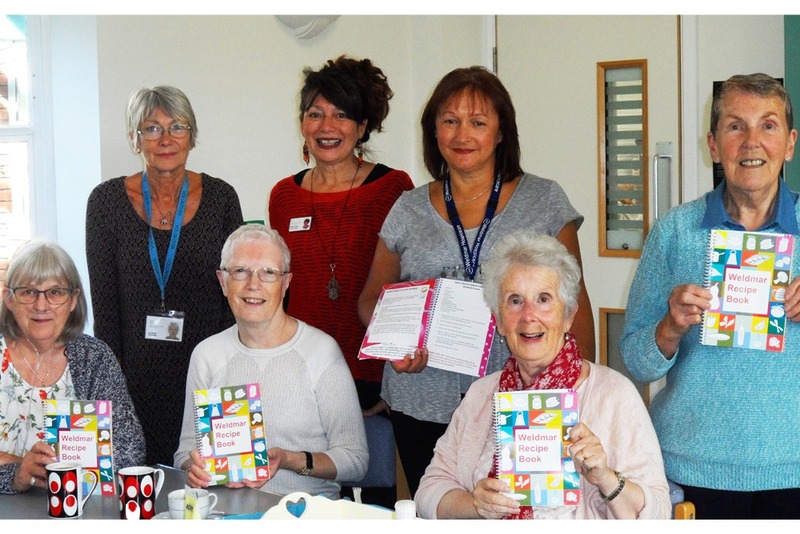 They talked to over ninety patients, family members, volunteers and staff about their favourite food related memories, recipes and top cooking tips. Stories included one from a shepherd who used to enjoy lamb tail stew, and one from a lady who remembered collecting coal washed up on the Northumberland coast as a girl to swap it in her corner shop for a bag of sweets. People have shared the inspiring ways in which they’ve reinvented the way they cook in order to cope with the limited mobility they now have since living with an illness. Others have shared how their loss of appetite or changing tastes have effected their quality of life. Family members have shared the ideas they’ve developed in coping with their loved one’s changing eating habits. Eileen Haste, Weldmar’s arts practitioner, said of the project, “It’s been such a delight to spend time with people and hear their stories and ideas. It’s moving to read about childhood memories alongside those describing how a loss of appetite has affected a person’s well being. And that’s just the stories. There’s a bonanza of recipes and tips in the book. One patient described freezing whole lemons that can then be grated over meals that need that extra zing. Brilliant! The book has become a real treasure trove”. The book also has an introduction from Sam White, the head chef at Weldmar’s inpatient unit in Dorchester, Joseph Weld Hospice. Having specialist experience of cooking for patients and family members, Sam and her team have contributed recipes that focus on nutrition, simplicity and affordability. The book is now available for £3.50 in the Weldmar Hospicecare charity shops on East Street and South Street in Bridport.